I've encountered a strange issue for the first time in the battle animation editor today. When I set a screen shake on several frame during the animation most of them are ignored when I test it in game, only one is displayed actually (the last one). Do you have any idea why it happens and how to go around this? 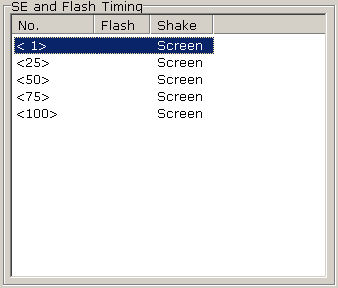 Set the Wait checkbox to any flash events, battle animations, or shake events. Otherwise it runs the events all at once and gets rid of overlap. Also, it only shakes once for each time, unless you Begin Shaking. If it still runs too fast to notice, consider adding Wait, like this. Doing this adds a gap between shaking. And you can lengthen the gap. There's no such parameters in the battle animation settings. What you are refering to is a battle group event or something event related. 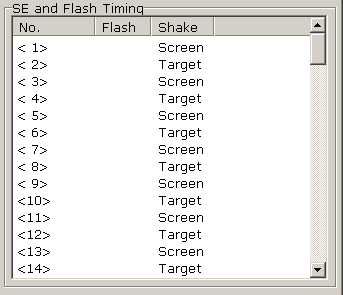 I am talking about the battle animation editor which has no "wait" and no options for shake duration. Are you using official 2k3 or the old unofficial one? I tested mine, which is very unofficial and modded, but I couldn't get anything to shake at all with any option with only a battle animation as you showed in your screenshot. So I can't give any fix. Can you explain what this battle animation will be used for, how it will be triggered, and what you are doing to test it? Have you tried changing it from screen shake to enemy. Just to see if that changes anything? Did you try changing any other options, like Cibler on the first screen? What you can do instead - show that battle animation, set wait to OFF, and add your own waits/screen shake to play alongside this animation. Most places where you can trigger this battle animation you can also run code after it, which can be wait/shake screen to get the same end result. I know exactly what you're talking about. I have a few solutions to this. 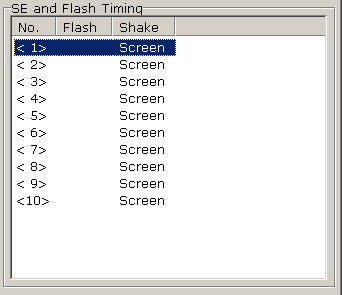 This is another workaround/glitch in rpgmaker2003, that will allow you to shake the screen for the duration of the animation. 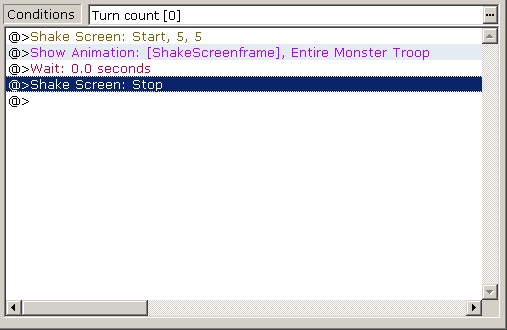 You'll have more control over the strength of the shakescreen command, but the problem with using this method is that it's ultimately reliant on being called upon by a battle condition in rpgmaker2003, so you'll have to figure how/when you want it to happen in battle - So this is more ideal for in-battle-cutscenes however. Your answer is so good that it made me want to add screen shaking to my animations, which I've never done before. Lord Blue Rouge's answer belongs in that topic with all of the 2003 engine workarounds/hints. It's a good use for the Save button next to Quote. Wow, awesome, thank you LordBlueRouge! I've learned something new with 2k3 today. I'll try that, then. Yup yup, good to learn new things. Also, the human eye can't process all the frames, so whether doing method one or two, the key is to make a gap in the screen shaking. That way, even someone sleepy is like, "Hold up, the screen isn't constantly shaking." Thanks Kaempfer ❤! and thanks everyone! if you guys know of that thread Zachary_Braun mentioned, let me know and I'll gladly repost it there. I recall seeing something like that on RMN or rpgmakerweb but I haven't been able to find it since. make sure to nominate Final Fantasy vs. Dog for the misaos. but there's an understanding of rpgmaker2003 here, that's worth looking into. 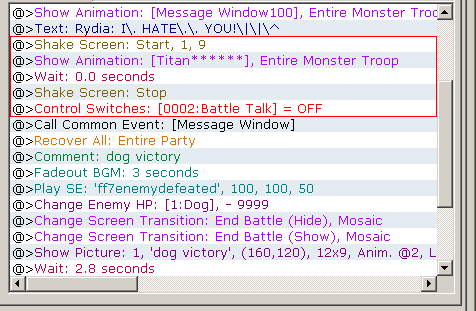 The one line battle message window, I learned from studying Leric's Cyberfactor. and trying come up with to a better one. Cecil's DarkWave, came about by studying this video and trying to correct it in order to understand why you can't do DarkWave in rpgmaker2003. that I think a lot of people should be really looking into, in order to better understand how rpgmaker2003 essentially works. 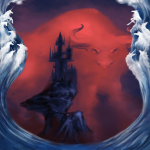 so how do you fool rpgmaker2003 or the player into thinking that it can? Rpgmaker2003 development becomes a whole lot easier. @Boulon I'm glad I was able to help out. Keep us posted on further developments! I'd love to see what that awesome tsunami battle animation will look like in action, once it's finished! surprised this has not been brought up yet but man this topic title is way way way way way way way way way way too vague.